This cozy home in Conway has a beautiful open floor plan for making memories with friends and family. The home accommodates 6 people with a queen bed, full bed and pull out sofa couch. Home is perfect for couples, solo adventures, families and business travelers. 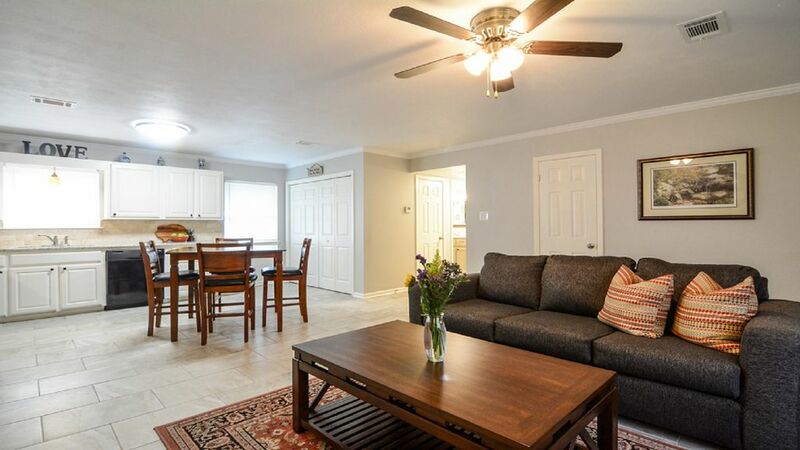 Everything you need is here with a fully equipped up to date kitchen, linens, basic toiletries, hair dryer, central heat and air, wireless internet access, flat screen TV, washer/dryer and ironing equipment. Outside the backyard is fully fenced in with large trees providing plenty of shade for those warm days. Great place for enjoying morning coffee and afternoon drinks. Location is excellent in the Historical District of Conway less than 3 miles from all 3 colleges in Conway and a short 1.5 mile drive to hospital. You're going to love our downtown, the home is walking distance to excellent restaurants, live entertainment and antique shops and shopping (approx 4 blocks). Less than a mile to walking/bike trail. Central Arkansas is conveniently located to several great hiking, biking, fishing, canoeing and boating areas. We enjoy riding motorcycles, hiking, traveling and spending time with our family and friends. In 1998 we moved to Conway Arkansas with our two sons and immediately fell in love with Conway, our new place we now call home. During our travels, we have had the best experiences staying at Vacation Rental Properties. Wanting to share this same opportunity with those visiting the Conway area we’ve decided to open our downtown home to business travelers, adventures, vacationers and pretty much anyone wanting to come visit our great city. We do not live on site, but we are close enough to take care of any needs that may arise. This property in downtown has so much to offer – Very close to UCA, Hendrix College, and CBC. You can enjoy all the excellent local restaurants, shopping, antique/flea markets – walking/biking trails, local parks and entertainment. Being centrally located in the state we have the best of both worlds, less than 30 miles to excellent hiking, biking, fishing, canoeing, boating and camping areas. Fully updated bathroom with all towels provided. Open to concept to the Kitchen. Coffee, tea, sugar and cream. Basic spices and cooking oil. Kitchen is fully remodeled with new updated appliances and kitchen utensils. Fully stocked kitchen, all you need is food. On Prince Street at Laurel Park about 5 minutes away. Smoking is allowed outside only. Chairs provided. This home was absolutely perfect for our trip! We came to town for a volleyball tournament and loved being able to stay in a home just a few minutes away from where my kids played. The home was clean and comfortable and convienent to everything! We loved having the open living/kitchen/dining area to relax after games. We will absolutely rent again if we play in this area in the future. Thank you Lesli! So happy you enjoyed your stay - hope to see you in the near future. Great experience, clean, and close to everything. We came to Conway for a wedding. The house was perfect for my family with 2 small children. Kris keeps the house spotless and fully furnished. We enjoyed how close the house was to everything we needed. I would highly recommend staying here. This was a great place to stay. The beds were comfortable the towels were fluffy and it was conveniently located to everything we wanted to do. Kris was very helpful. All the information we needed was printed out for us and the cookies were a very nice touch. I would definitely stay there again. The house was extremely clean, and the kitchen was well stocked as described. The linens were great quality, and the house was just the right size. The bigger bedroom mattress was not comfortable though, which is the only reason for the 4 star rating. The location and size was perfect. We had everything we needed. Very clean, updated and cozy. We will book this house again, so I can cook for my college daughter and her ffriends. We enjoyed another great football weekend in Conway at the Downtown Charmer. Kris is a great host. Close to areas for hiking, kayaking, canoeing and biking. We are 45 minutes from Petit Jean National Park and approx 30 minute to Woolly Hollow. 8 Minutes to the Conway's Tucker Creek walking trail. 30 miles to Little Rock. 1 hour to Greers Ferry Lake.